Parenting techniques and theories--on Dad's terms! Are you ready for cluster feedings and cradle cap? How about meconium and jaundice? With The New Dad Dictionary, you no longer have to page through parenting tomes to understand what everyone is talking about. From engorgement to independent play, author Chris Illuminati offers a crash course in today's parenting language, guiding you through the foreign territory of doctor visits, magazines, and conversations with Mom. Featuring hundreds of real-life explanations for popular words and phrases, each entry not only translates these textbook terms into plain English, but also teaches you what changes to expect from your baby--and Mom--during this time. 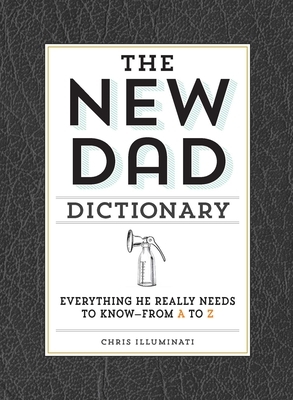 So stop banging your head against the wall and discover everything you need to know about raising your child with The New Dad Dictionary! Chris Illuminati is a writer, humorist, and dad. He's the creator of the popular parenting blog Message With a Bottle. When he's not making fun of parenting issues on Post-It notes, Chris is a senior editor for Guyism.com. You can visit him online at http: //messagewithabottle.tumblr.com and www.chrisilluminati.com.